​Instead of focusing on the ​dirty play by Manny Machado when running across first base and clipping first baseman Jesus Aguilar, the ​Milwaukee Brewers need to be ready from the get-go in Game 5 today. ​​Yes, Clayton Kershaw is on the mound for Los Angeles, but he his postseason resume has some rough moments, including in Game 1 of this series where he lasted only three innings and gave up five runs on six hits. We focus on the Milwaukee bullpen, but the Brewers offense is what really makes this team go and they were brutal in Game 4. Over their 13-inning affair, the Brewers were 0-for-8 with runners in scoring position and struck out a whopping 15 times. The NLCS got infinitely more interesting with Dodgers 2-1 win over #Brewers in 13 innings. Series tied 2-2 now. Kershaw in Game 5. 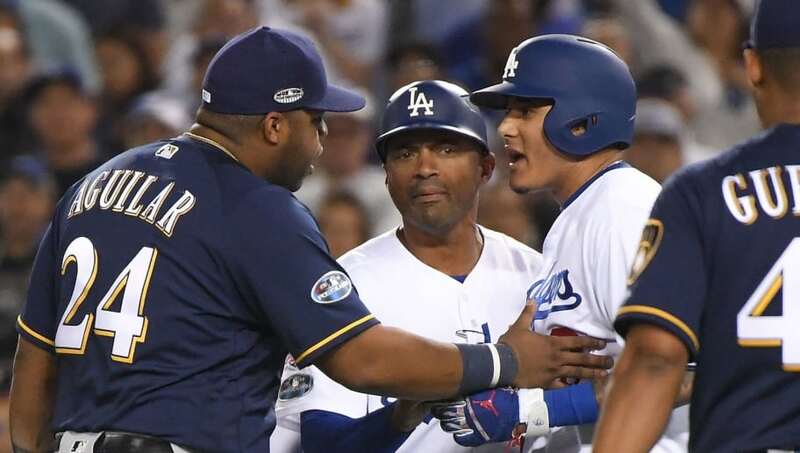 #Brewers stewing over Machado, who they called "a dirty player." Gonzalez injured and to be replaced. Lots of high drama. That can't happen today if they want to have a lead in the series going home to Milwaukee. You hate to use the cliche of this is a "must win," especially since it's not an elimination game, but this feels like that for the Brewers and they can't mess around. They need to punch Kershaw and the Dodgers in the mouth and keep their cool after being riled up in Game 4. If they can beat the Dodgers in this one, LA will be seriously deflated headed back to Milwaukee.